Hello or should I say Shalom from Israel! 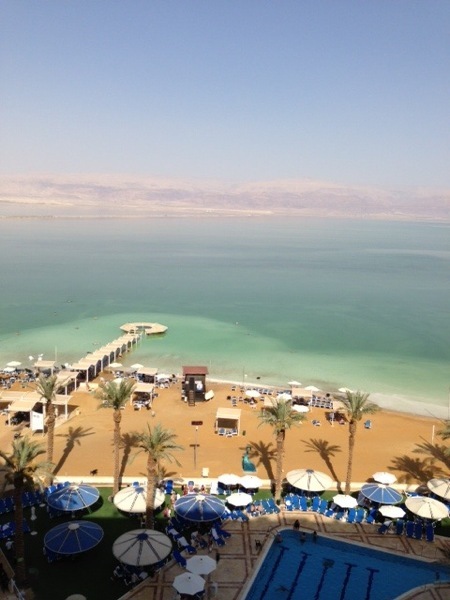 I am writing to you on Wednesday afternoon here in my hotel located in Israel right on the Dead Sea. I have been here for about six days laying out in the sun working on my tan, and also enjoying time with my family. Mimi and my Uncle Chip and I came early to Israel before the tour came so we could enjoy some time at the Dead Sea. It really is amazing to come to the Dead Sea because you not only see Israeli people but you see people from all over the world. Doctors will prescribe people who are sick to come here and lay in the sun and go into the sea. The sea is called "The Dead Sea"because there is no life in it, it is full of salt and minerals that are helpful not only for skin but for your bones and joints. So we have been staying here and waiting for the tour to come and meet us at the Dead Sea. The tour officially came in last night. The tour has officially started as of today we went to Ein Gedi, where David and his mighty men hid in the caves from King Saul, and where they retreated to, there are so many waterfalls it is so beautiful. Then after we were there we went to Masada where King Herod built palaces on top of the mountain. So interesting about Masada is that some of the Jewish people rebelled against the war and committed suicide. One of our Israeli guides told us that they didn't want to conform and surrender to serve the Roman gods. They were so passionate and put there whole heart into serving God that they said to die was better. How passionate are you about our God? I was thinking to myself would I be willing right now to jump over a mountain and die to serve my God as they did so long ago. Not saying that someone should go jump of a cliff to show that you love God. I mean that we are so passionate and with our full hearts that we serve God with everything in us! Something to think about... We are in the last hour that either we are completely immersed in Jesus or we will be more tempted to walk away. The enemy knows that his time is short. But we always over comethrough Him!!! And they overcame him by the blood of the Lamb, and by the word of their testimony;and they loved not their lives unto the death.